Let's suppose that you want to redirect a domain that you have no control over to a different address or add a subdomain to a domain that you don't own. One way to do that is to modify the /etc/hosts file. But what if you want other people to see your changes? You'd need to ask that they synchronize your hosts file with theirs every time you make changes. Another option is to set up your own DNS server. In this post, we're going to implement a simple DNS server in node.js that will forward all requests to the real DNS server but hijack requests to domains that you want to control. I'm going to call it a DNS proxy but I know that it's not a real term. I came across this problem at work a while ago when I needed ci.gitlab.company.com to point to gitlab.company.com but the sysadmins were unable to do this for some reason in the near future. Right, it timed out because we are not handling requests. What we want to do now is set up proxying. When a DNS request comes in, we want to forward it to another DNS server (authority) and respond with the answers from that. 8.8.8.8 is a public DNS server operated by Google that we're going to use. The reason I chose it is that its address is very easy to remember. We have a working DNS proxy. Now let's modify the handleRequest event handler to examine the request and check if it's for a domain we are insterested in. If so, we can craft a custom response, otherwise proxy it as before. Now any domain that matches the hello.peteris. * regex should resolve to 127.0.0.99.
cname.peteris.rocks is an alias for hello.peteris.rocks. Let's add a simple UI for managing the domains to take over and their records. We're going to have a simple HTTP server that will serve a very basic UI for editing records. There will be no authentication and the only protection will be a simple hardcoded password that you need to enter when making changes. It's going to be so basic that we're going to store all records in a file. We will be using Angular.js to edit the records.json file in the browser. We've also added some Bootstrap styles to make it look nicer. Enter the password ilovekittens before saving changes. since you will have no internet access once you hit Ctrl+C. Alternatively, use dig for testing. 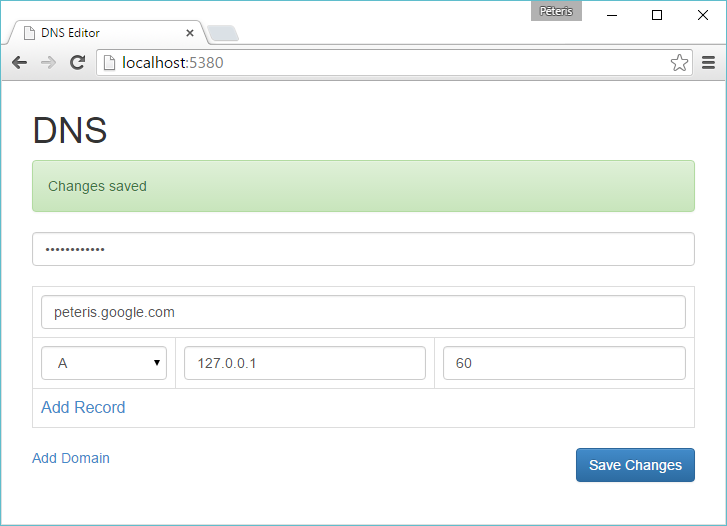 You can use @127.0.0.1 to specify your DNS server. dig will also give you more detailed output about the DNS server responses. This took me less than an hour to build (thanks to native-dns, angular.js and other libraries) and was pretty fun. Needless to say, you should not use this in production. The code published in this blog post is licensed under the Apache 2.0 license, if you want to use any part of it.